As one of her last actions in office, newly resigned Public Transport Minister Lynne Kosky has announced that Victorians will be able to get free myki cards online until Jan. 31, according to Berwick News. So far, over 160,000 cards have been ordered, according to Kosky. 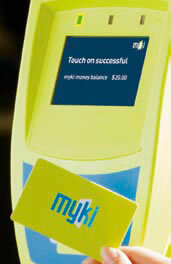 After January 31, myki cards will $10 for full fare and $7 for concession. Students will be still be able to receive free myki cards when they submit their application for the 2010 Victorian Public Transport Student Concession Card at a staffed train station or the MetShop. Kosky’s replacement, former union boss Martin Pakula, has announced that fixing the maligned myki network will be his top priority, and hopes to have the system up and running in 12 to 18 months.